Vis has always been a magical and distant island. An important port in the time of Antiquity, a place for the country villas of the Hvar nobility during the Renaissance, an important commercial centre, the venue of the most crucial naval battles of the 19th century which determined who was to rule the Adriatic. Throughout it all Vis was also home to the fishermen of Komiža, always ready to defend their right to the sea and their fishing privileges, and of farmers who tended their vineyards in frequently unfavourable conditions. It was separated from the mainland and at the same time strengthened by the Vis Channel, in which it was not easy to navigate in the old trabakul (two-masted coaster) and steamships when the summer tramontana blew, much less during a northeasterly bura or easterly levant during the winter. And then everything changed. Nautical tourists arrived with their new, ever larger, faster and better vessels. The Vis Channel, even though its waters can really be rough, ceased to be a bugbear. In the summer it is navigated daily by hundreds of boats. When you get to Vis, give it the time it deserves – at least a dozen days. Only then will you experience the island in its full beauty and sail into at least a few of its fifty-four coves. Having left your vessel in the safety of Sveti Juraj (St. George) harbour, abandon yourself to enjoying Vis, a town of a rare atmosphere, wandering through the its narrow streets and strolling along the harbour waterfront, tour the cemetery on the headland of Prirova where life and death meet in the midst of a large bay, the peace of cypress trees and the commotion of beaches and swimming areas. Tour the remains of ancient Issa and the thermal baths, the English and Austro-Hungarian fortifications, tour the museums, visit the pubs to sample the local bugava and plovac wines and enjoy what is possibly the greatest concentration of first rate culinary delights. The southern side of the island is unique in its unspoilt beauty. One cove follows another, Stončica with the lighthouse on the headland facing it, Smokova, Milna, Zaglav, the fishing village of Rukavac, then Srebrena, and in the waters around them the islets of Greben, Paržanj Veliki and Paržanj Mali, and the rocks Pupak, Žuberka and Pločica, Budihovac (Budikovac) Veli and Budihovac Mali and Ravnik which encircle them and protect them, feeding their fishermen with still bountiful catches. Budihovac, the islet with one of the most beautiful lagoons in the Adriatic, and Ravnik with its Zelena špilja (Green Grotto) in which the light seeps through an opening at the top and refracts in the sea – they are all tales unto themselves. The coves come one after another, each with its own history and its people of today— Ruda, Velika Travna and Mala Travna, alternate with rows of stone slabs set one against the other – as if laid down by the hand of some gigantic builder. And there is Stiniva too. Tall headlands on both sides draw ever nearer into a funnel shape, and at the end the tall cliffs, like two megaliths, almost merge together leaving a passage but a few meters wide, and then widening again into a little world of its own. As if we had come to the bottom of a roofless cave. Inside is a strand, four cottages and a feeling of complete protection. 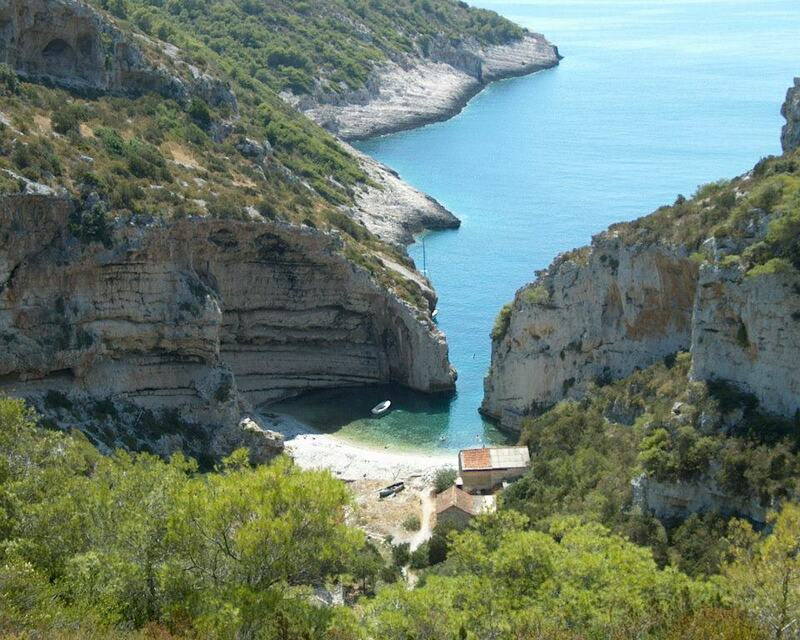 The coves continue, all the way to Komiža, white strands between rocks with the odd house on a barren rocky shore. The peaks of rocks worn away by waves are the realm of the largest gulls in the Adriatic. Komiža, a renown fishing village of Dalmatia, is huddled in the north-eastern corner of a bay under the Muster church and the tall hill known as Hum. The rocky coast descends steeply into the sea, hiding virgin strands that beckon – once you have moored in Komiæa take a dinghy and come, and have the beach all to yourself for a day. The fishermen of Komiæa are to this day renowned for their fishing knowledge, boldness and catches. Their fleet is anchored in the harbour, and a fishing museum in the tower recalls the days of glory and the replica of the falkuπa type gajeta (a single-masted fishing boat) gently rocking in the waters of the port. If your route brings you here in late autumn you will witness the ancient tradition of burning an old boat on St. Nicholas’s feast day to ensure safety and calm to those who sail and fish, and the favour and protection of the honourable Bishop of Myra. From the Komiža waterfront you can see Biševo, and when you sail out of the bay, and look across the volcanic isle of Brusnik, you can see the islet of Sveti Andrija, or as the people of Komiæa call it, Svetac. Both islands are practically tied to Komiæa by an umbilical cord. The sparsely inhabited Biπevo, and Svetac – whose last inhabitant, who happened to be a woman, departed a few years ago – come to life in the summer. Many yachts drop anchor in the Biševo coves of Porat, Salbunara ad Mezoprat, while dozens of tourist boats and yachtsmen dock in front of the famous Modra špilja (Blue Grotto) in which the play of light seeping through a submerged opening creates a wondrous light show – eager not to miss a chance to swim in its silver blue waters.